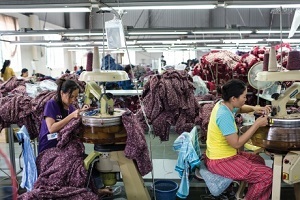 Sep 11, 2014 Three global unions, representing millions of workers around the world, are mobilizing to back Cambodian garment unions’ demands for higher wages. 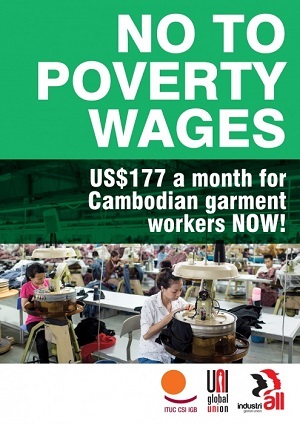 Global unions are joining Cambodian garment workers in a day of action on 17 September as they strive for a living wage. Sep 11, 2014 Members of IndustriALL Global Union’s affiliate Kristal-Is went on strike on 20 June 2014 over the failure of sector-wide negotiations in the glass industry. 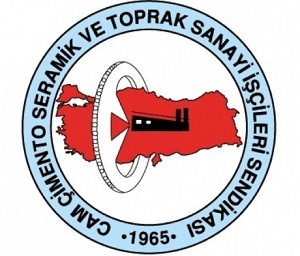 The Turkish Government postponed, in reality banned, the strike eight days after it was launched. According to Turkish legislation, “a lawful strike or lock-out that has been called or commenced may be suspended by the Council of Ministers for 60 days with a decree if it is prejudicial to public health or national security. The suspension shall come into force on the date of publication of the decree“. The legislation further reads “if an agreement is not reached before the expiry date of the suspension period, the High Board of Arbitration settles the dispute upon the application of either party within six working days. Otherwise, the competence of the workers’ trade union shall be void”. It is a well-known fact that the High Arbitration Board never rules in favour of union demands because it is dominated by government and employers’ representatives. This is why Kristal-Is has pursued a strategy to conclude the agreement without going to compulsory arbitration. In the meantime, Kristal-Is has applied to the State Council for nullification of the Government’s Decree with a demand of suspension of its execution for being able to continue to strike. However surprisingly the State Council has refused this demand on the contrary to its earlier jurisprudence on the basis of economic arguments rather than protecting fundamental rights. In addition to this, Kristal-Is has filed a complaint against Turkish Government at the ILO over violation of the right of collective bargaining, and IndustriALL Global Union supported it. In the meantime, Kristal-Is and its members engaged in a series of nationwide actions. Before the sixty-day suspension period was about to be over, Kristal-Is has organized a secret-ballot vote on 26 August with its members over the last offer made by the employers at the onoging negotiations. On the basis of the results and potential risk that the collective agreement be concluded by the High Arbitration Committee, Kristal-Is has decided to sign. The new agreement has brought important achievements to the union members. With the new deal, wages were increased with an average of 14% and a substantial improvement has been made for lower-paid categories. Bonuses and other social payments were augmented by between 10% and 49%. The agreement covers 5800 glass workers in ten factories of Sisecam group, namely Trakya Cam, Trakya Mersin, Trakya Yeni?ehir, Trakya Otocam, Cam Elyaf, Pa?abahçe Eski?ehir, Pa?abahçe Mersin, Pa?abahçe K?rklareli, Anadolu Cam Mersin and Anadolu Cam Yeni?ehir. 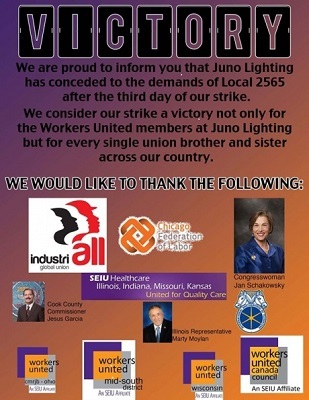 Sep 10, 2014 After three days of strike launched by the workers of Des Plaines, Illinois Juno Lighting Group the management of the group agreed to satisfy workers’ demands. The workers went on strike as the last remedy in their fight for decent conditions and fair wages after several months of negotiations prior to the end of the previous agreement in August. At the end of the strike the Chicago and Midwest Regional Joint Board representing the striking workers shared the information about Juno Lighting workers’ victory. Reportedly the newly reached deal includes an average wage increase from US$11.90 to US$13.30 per hour. Also workers managed to obtain improvements in many other benefits including the double sick pay and a decrease in the cost of family insurance. In his letter to IndustriALL Richard Monje, International vice president of Workers United/SEIU praised the support of the IndustriALL Global Union family playing an important role in assuring justice for Juno workers, he said, “this is a victory not only for Workers United members at Juno Lighting but for global labor solidarity“. Sep 11, 2014 More than thirty participants representing workers employed by the third largest tire-maker from the United States, Turkey, India, Indonesia, Malaysia, Thailand and the Netherlands unanimously decided to re-activate the Goodyear Global Union Network which has been formed in 1999. The Goodyear Global Network worked over the priorities of exchange of information and experience; support actions in union organizing; improvement of occupational health and safety conditions; and active international solidarity among the participating unions. In the meantime, Goodyear unions in the Asia Pacific region cooperated through a regional network through a series of physical meetings held in 2000, 2002, 2005 and 2008 over health and safety matters with hazardous materials at plants; industrial accidents and occupational diseases; safety committees –composition, and activities-training. Hosted by IndustriALL Global Union’s Turkish affiliate Lastik-Is, Rubber, Chemical and Oil Industry Workers’ Union, representing Goodyear workers in two plants located in Izmit and Adapazari, on 4-5 September, the 2014 global union network meeting discussed burning issues related to the tire industry in general and particular matters regarding Goodyear. “As the first global one in the tire industry, the Goodyear network has played a very important role for international solidarity” said Abdullah Karacan, General President of Lastik-Is. “I do believe that after this meeting each of us will be conducting our day-to-day action in a more effective way”. According to recent estimations, “the automotive tire market is set to reach close to US$250 billion globally within the next five years”. It is reported that there are between 700 and 800 tire-makers in the world, and probably near 650 in China. The Izmit meeting endorsed and appreciated IndustriALL Global Union’s key strategies and actions, particularly on trade union networks. Goodyear unions elaborated global trends in the tire Industry with a particular focus on Goodyear through a global overview of the economic situation, investments and employment. One important item discussed was the trade union situation in Goodyear operations worldwide. Tom O’Shei and Jim Mason from the United Steelworkers of North America briefed the participants on the collective bargaining process in the US plants since 2006. The Turkish case presented by Lastik-Is attracted attention of the delegates with new gained rights such as complementary public scheme. The meeting finally discussed a further work plan and how to keep the network functioning with a unanimous decision to revive the structure. The delegates later visited the Goodyear plant in Izmit, capital of the tire industry in Turkey, and met with factory management, shop stewards and workers after a tour. The plant is nearly one-hundred percent unionized and therefore the union has real power and is because of that totaly accepted by the management. It was a good example, the power of the union is its members. 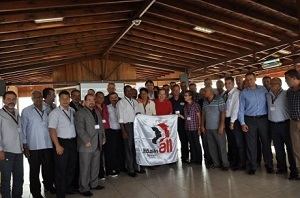 “IndustriALL Global Union’s strategy in the tire industry is to build global union power through strong networks,” said Kemal Özkan, Assistant General Secretary. “The Goodyear global union network will continue to play an important role in this strategy”. Goodyear is one of the world’s leading tire companies, particularly in North America and Latin America as number one and in Europe as the second largest tire maker. Goodyear employs approximately 69,000 people around the world operating 51 plants in 22 countries. Its major brands are Goodyear, Dunlop Tires, Kelly Tires, Fulda, Sava and Debica. Sep 11, 2014 Yet again this week mining trade unions are forced to mark the avoidable deaths of fellow miners, killed on 4 September by lax and underfunded safety procedures. The last of the five Bosnian miners’ bodies was recovered late Sunday, 7 September. The five were killed after an earthquake triggered a collapse inside the central Raspotocje mine near the town of Zenica, central Bosnia and Herzegovina. The 3.5-magnitude earthquake caused explosive fractures in the rocks as flammable methane gas pockets were released. The collapsed shafts trapped 34 miners, 29 of whom were rescued within 24 hours of the accident. The joint memorial of the five killed miners took place on Monday in Zenica, with thousands of people attending. The five were then buried in village cemeteries near the town. Raspotocje has a reputation as Bosnia’s most dangerous coal mine, with frequent rock bursts and accidents. Raspotocje produces coal for Bosnia’s largest power utility, EPBiH, and employs 430 miners. The authorities have not addressed the safety concerns since war damage sustained during the 1990s. The Raspotocje mine was one of seven coalmines merged in 2009 by the government to supply the EPHiH utility’s coal-fired energy plants. As part of that deal EPBiH pledged to invest more than 70,000 Euros over five years to improve working conditions. Although that money has been spent, almost none has gone to Raspotocje.